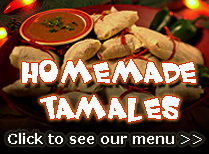 We are a local Hispanic family making traditional homemade tamales in the East Texas area. Our tamales are prepared by hispanic ladies using an authentic Mexican recipe. Our tamales are made fresh each day. So when you place an order, we immediatly begin to prepair your order for pick up. When you pick up your order, it'll be fully cooked and steaming hot! We no longer ship tamales. The cost of shipping is more expensive than the actual order. For example, over night shipping of 3 dozen tamales cost around $60 dollars!